Jesus, walking along the Emmaus Road, conducted the greatest Bible study of all time. In that study he started with Moses and then continued through all the Prophets interpreting in all the Scriptures the things concerning himself (Luke 24:27). Jesus tells the Jewish leaders, “You search the [Old Testament] Scriptures because you think that in them you have eternal life; and it is they that bear witness about me” (John 5:39). Such passages could be multiplied. 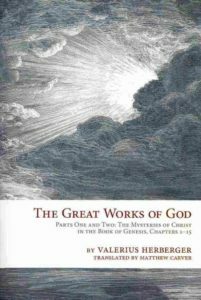 Few of us, these days, take such witnesses about the Old Testament as seriously as Valerius Herberger (1562-1627). So, beginning with Moses and pushing on through Ruth (he planned to do the entire Old Testament but his death ended the project) Herberger examined every nook and cranny for the presence of Jesus. The book is a treasure trove of devotional gold. I don’t know if Concordia is planning to publish the rest (Genesis is available in two volumes), but I sincerely hope they do. The image often depicted of the theologians and theology that was present during the days of Herberger is that of being dry, dead, boring, and generally unhelpful to the man in the pew. Nothing could be further from the truth about this book. (I might add that other books I’ve read from this time period indicate that Herberger’s devotion and vitality was the norm, not the exception.) The insights from this book breath comfort, compassion, encouragement, hope, and all found in our Lord Jesus. What you find in Scriptures often is directly related to the questions you bring with you. If you are asking “How does God want me to live?” you will find rules. If you are asking, “Who is God?” you will find sublime truths. The question Herberger is always asking is, “How does this reflect Jesus and God’s grace?” In other words, he takes Jesus’ explanation of what the Old Testament is about, seriously. It makes for a very “Christian” way to read the Old Testament. • Herberger is a child of his age. He will refer to the views of leading scientists which have since been either modified or rejected. To Herberger’s credit, he typically does not canonize the views, simply uses them to illustrate his point. So, for example, he writes, “The stars … who can say how many there are? The ancients counted 1,022 of them; our contemporaries have observed 300 more than that. But God alone knows their true number (Ps. 147:4).” Today the estimate is around 100 octillion (a 1 with 29 zeros after it). This much larger number only makes Herberger’s point much stronger. • The same holds true in reference to history, nature, and so forth. Do not let this distract you from the big picture, even when Herberger holds the views without question. • Herberger also uses analogy and typology. • For the died-in-the-wool protestant, the reader might be surprised by Herberger’s use of the Apocrypha. It is helpful to remember that the Apocrypha has a long and blessed history, recognized as helpful by all the main Reformers of the 16th century. We might also remember that Roman Catholics and Eastern Orthodox Churches hold these books to be canonical. While I do not share the view of these churches, I do share the view of the 16th century Reformers that believed these books are a blessing to the Church. • No knowledge of Greek, Hebrew, Latin or German is needed. • Finally, while this is a commentary, you will not find page after page of word studies, diagramming of sentences, and so forth. There are plenty of commentaries that do such things. This could be called a devotional commentary. If you are interested in how birds point to Jesus, or how the rivers in Eden point to Jesus, or how flowers point to Jesus, and so much more, then you will truly be blessed by this book.